We're accepting enquiries from new wholesale customers again. 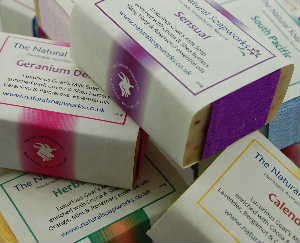 So if you're looking for luxurious natural skincare products, formulated by a professional Aromatherapist and handmade with care using only the finest quality ingredients, we're sure The Natural Soapworks can be of assistance! 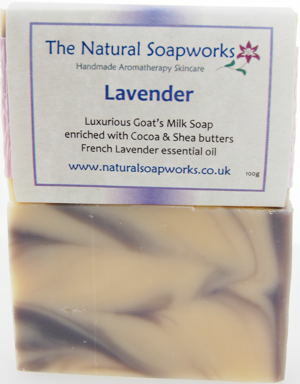 Our luxurious goats milk soaps, aromatherapy bathing and natural skincare products, are all handmade to our unique specifications using only carefully selected natural ingredients. Most of our ingredient suppliers have Soil Association organic accreditation, so you can be guaranteed of receiving top quality natural products, handmade to order that work in harmony with the skin. We're very proud that we actually manufacture our products ourselves - so this means you won't be receiving pre-purchased cosmetic bases which have had a few essential oils added! As Holistic Therapists we genuinely care that so many of our customers have troubled skin conditions (it's why we started the company). That's why we take such care in selecting only the best natural ingredients, to create gentle formulations that work and do not contain any of the cosmetic ingredients which are causing media concern. You will not find any SLS, PEG's, Parabens, DEA/TEA's, Tricolsan, Phthalates, mineral oils or petroleuum derived ingredients, Propylene Glycol, synthetic fragrances or colours in our products. The European Cosmetics Regulations are specific about the labelling requirements for cosmetic products. Our natural products have clear INCI ingredient labelling (stating the latin botanical names of plant species), with more user friendly translations of each ingredient so your customers can quickly understand and appreciate the natural ingredients in each product. Each product is batch coded and has a specified use by date printed on the label. Wherever possible we use environmentally friendly packaging and containers which may be recycled including PET plastics or glass. We use environmentally friendly inks. We also offer an innovative biodegradable film wrap (instead of plastic), which is compostable in a standard home compost bin. We think it's important to work closely with our stockists, getting to know them and their businesses to support their needs. We'll spend time explaining about natural ingredients, assisting in product selection and if you have any queries we're just a phone call or e-mail away. We believe in fair pricing for our handmade products and our ethos is that you 'get what you pay for'. We deliberately select only the finest ingredients for our products, and never compromise on quality just to secure an order. The end-user of Natural Soapworks products is of vital importance to us, so we never wholesale products containing cheap filler ingredients. Instead we work with our stockists so they select the right products and fragrances for customers, with low minimums so stock is always as fresh as possible. We also insist that stockists sell our products at reasonable prices - people with sensitive skin types need affordable natural skincare, not products that are excessively priced to the point that they've become expensive luxuries which can't be used on a regular basis. 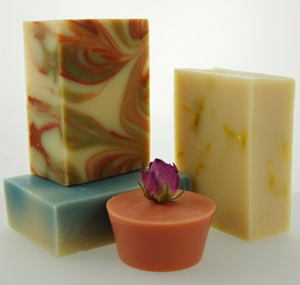 The Natural Soapworks achieved BUAV's Humane Cosmetics Standard in 2010. Now operated by Cruelty-Free International, this is the worldwide gold standard when it comes to producing cruelty free cosmetics, and demonstrates our commitment to only use suppliers that can prove there hasn't been any form of animal testing involved in the production of a cosmetic ingredient. This means that our products proudly carry the Leaping Bunny logo on their packaging. Our ethical stance on careful ingredient selection also means that we always try to purchase fair trade, ethically produced materials for use in our products. In the first instance, visit our Wholesale Natural Skincare contact page on the Natroma website. We'll need your contact details, information about your business, (it would be helpful to know the types of products already stocked), products you're interested in and your timescales for receiving your first order. Please be aware that we select our stockists very carefully, and never permit our products to be sold on E-bay, Amazon or other internet auction sites, at markets or via other temporary arrangements. Typically our stockists are registered businesses and include independent/holistic retailers, salons and professional therapists. Please note that wholesale pricelists and our standard terms and conditions will only be supplied, once we've received further information and have had an initial discussion to clarify our products are suitable to be stocked. We do not supply free samples (as you can imagine we are inundated with requests, and if we responded to everyone we'd have to increase our prices which would defeat the object of our products being so afforable to customers! ), so there will be a nominal charge for the supply of product samples.